In 2005 our Exchange Program began a relationship with the Bagan Lacquerware Technology College in Myanmar. Yearly workshops and slide lecture series have been held by Japanese lacquer experts and university professors in order to introduce a Japanese lacquer art, techniques, and design to the faculty and students at the college. The goal has been to exchange knowledge and expertise in the field of lacquer art and technology and to stimulate new directions in Myanmar and Japanese lacquer arts. 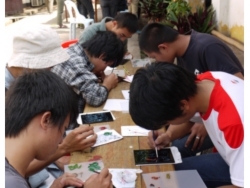 We will again hold workshops at the Bagan Lacquerware Technology College in August. Using this experience, we started a new project in Laos at the School of Fine Arts in Luang Prabang in 2011. We would like to continue this project by having lectures and workshops at the college at the beginning April. We will be in Luang Prabang from 30 March to 3 April. We believe that this is an opportunity for the faculty teachers and students at the School to increase and expand the artistic expression inherent in Laos lacquer art. We hope in the coming years to continue this lecture and workshop series for the mutual benefit of all. ■Explanation technique and preparation design for next day. What is urushi (natural lacquer)？We held several slide shows to introduce Japanese lacquer, its history, techniques, and potential. We also brought traditional lacquer craft materials, tools and sample works from Japan and Myanmar. Ten lacquer experts and artists from Japan and 28 teachers, students, and people from lacquer workshops participated. / Copyright 2016 Asia Lacquer Craft Exchange Research Project. All Rights Reserved.